Now lets take a look at some of the details just for fun! A fun little banner using the MME Chippies. 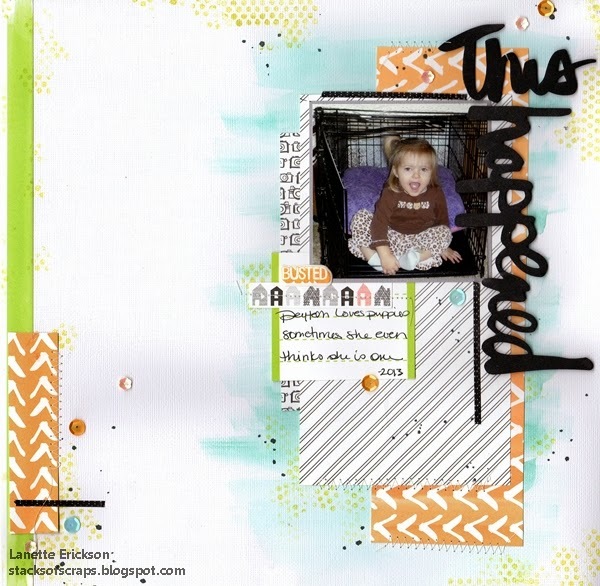 and a bit of journaling using some MME stickers..
NOW don't you just love this kit! Well I have good news for you have a few kits left so hurry on over and pick yours up today! I love using sketches. I don't always copy them exactly, but I love using them as a starter. Sometimes the fun is just searching for the sketches. Today I have found a few I want to share with you. This one came from the October Afternoon blog. Then I found this one over on the Bella Blvd blog. 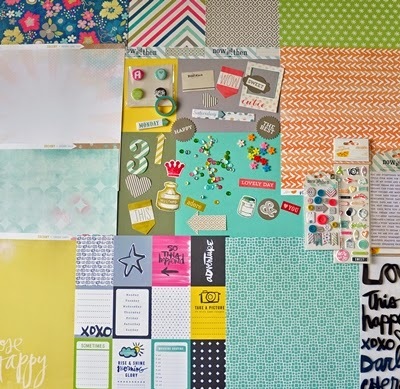 This one was from the Studio Calico blog. There is always my favorite place to go too-Page Maps. Where do you go to find sketches? I would love to hear about some other places to check out. You haven't heard from me in a couple of weeks because of some glyches with Typepad, I've definitely not been away from scrapbooking. This month, I'm doing another Layout A Day challenge. And I've stayed on track so far, in no small part because I'm working from the fabulous 3 Scrappy Boys May Trio Kit. I loved how the papers and embellishments from the kit worked with these photos of my girls with their Easter baskets. The colors aren't the expected pastells, but they're still nice and Spring-y. I don't make a lot of cards, but Mother's day and my aunt's birthday were a day apart, so I made this trio of cars for my sister, mother, and aunt to celebrate. We also made these bouquets, but more on that another time. Did you get one of Heather's kits in the last few months? I would really love to see what you're doing with them. Come over and share your work in our Gallery so we can show it some love! I hope everyone is enjoying their Memorial Day weekend! When I received the kit this month, I was very excited to see all the happy and bright colors that were included in the Lucky Stars line by Bella Blvd. Like so many other scrappers out there I am just loving watercolor! There are so many wonderful ways to use them I really think they are a must have for everyone!! As you can see with just one simple water color and and lots of May's Trio Kit my plain Jane White Cardstock came to life!! This months Trio is Amazing and there are just a few left make sure you grab yours today!! Hi! It's Sally here. Today I wanted to share a layout I created using Bo Bunny The Avenues. From this collection, I was sent two sheets with corals and tans on it with a hint of light aqua. I instantly fell in love with the color combo and knew that I wanted to use it. Plus it mixed well with two sheets from Bazzill Basics Vintage Lace collection: the aqua from Vintage Blooms and the tan laced squares paper. Last November when my sister's and I went on a sister's trip to Seattle, we loved all the yummy food places. Lola's was our first one to discover for breakfast and it was Fantastic! We loved it so much we went back every day to try something new. One yumminess we discovered was homemade donuts. They are made fresh and sprinked with sugar while they are hot. Then they're served with homemade jam and some kind of fantastic cream sauce. Yum!! I thought it was a perfect photo for these papers/colors. Here is what I created. The flowers are leftover from my April Trio kit. Aren't they perfect?! I used some VERY old transparent hearts from my stash as well as a doily, mist and my coral letter thickers. The lace is from K&Co and it's a set of lace frames. I just cut one in half diagonally and used to add some texture. The clock is fussy cut from one of the papers in The Avenues collection. I topped it off with some fun tan Bella Blvd Washi Tape that Heather sent. Finally had some time to dig into my May Trio kit and make a few things. I really like how well everything came together. I love the thicker words, so perfect for quick and easy titles! Here's where it's pretty cool to be the owner of the store. There are always some random embellishments left over after packing all the kits. Typically they go into embellie grab bags, but I really liked the thin washi tape in the kit and I needed a different color for this LO, so I grabbed them back out. I can't wait to see what you guys make with this kit! Hello! Sally here. As promised, I thought I'd share the layout I created using Lanette's sketch and my April Trio, which I loved!! Honestly, I'm kind of sad that it's time to move onto another kit, though I'm having a fun time with the products I'm playing with since my new kit is filled with fun, happy colors. Last month, my Grandma passed away after 93 wonderful years. I suppose her memory is what prompted me to scrap this photo from years ago at a Grandma/Grand-daughter day. This "dune buggy" has been on Grandma's farm since I can remember so all of us granddaughters have lots of memories with this. For this layout I used a little October Afternoon but mostly I used the Crate Paper Boys Rule line. I decided to hand stitch my circles in the different colors I used. Then I had to finish it off with that darling go cart wood veneer from the kit. One little tip on the fun Jillibean Beanboard alphas that come in the kit. These come in a package and do not have adhesive on them. I love them but never know if I have the right letters so one tip from me: take the back off of the packaging and save it as it has all the alphas pictured. Then I sort them by uppercase, lowercase and numbers and place them in separate baggies. Then as I use a letter, I mark it off the back piece I saved from the packaging so I can see what I have left to work with. I hope that makes sense. I know it helped me as I used more and more of them so I didn't have to sort through them everytime I wanted to create a title. And as a reminder, here is Lanette's sketch. I kept it pretty close to the original except I only used one photo. Thanks for stopping by. I challenge you to play with Lanette's sketch. I had a great time with it and I'd love to see what you do to create your circles. Happy Scrapping!! This month I'm working with the Trio Kit, and it's a really fun one! My absolute favorite thing in the kit is the package of Amy Tangerine word and phrase thickers. I'm having so much fun playing with them. What I love most about foam thickers is that they are really easy to manipulate when I need things that didn't come in the pack. The question mark on this page was made out of one of the hearts that was in the pack. What are your favorite parts of the May kits? Stop by the gallery and share your work with us! More from my April Goodies! Happy Mother's Day to all the mommies!!! Nicole here to share another double page layout I made with papers from the April kits and my challenge concept of taking new items (from the April kits) and old stash products to make a mixed kit to play with. I used elements from the Simple Stories papers to make my own embellishments and 4x6 "cards". I also incorporated some stamping for fun and added interested to the pages. Be sure to check out the deals on previous kits going on now in the store!